Comparison of immunostaining intensity using Polink-2 HRP detection kit with other source polymer detection kit. 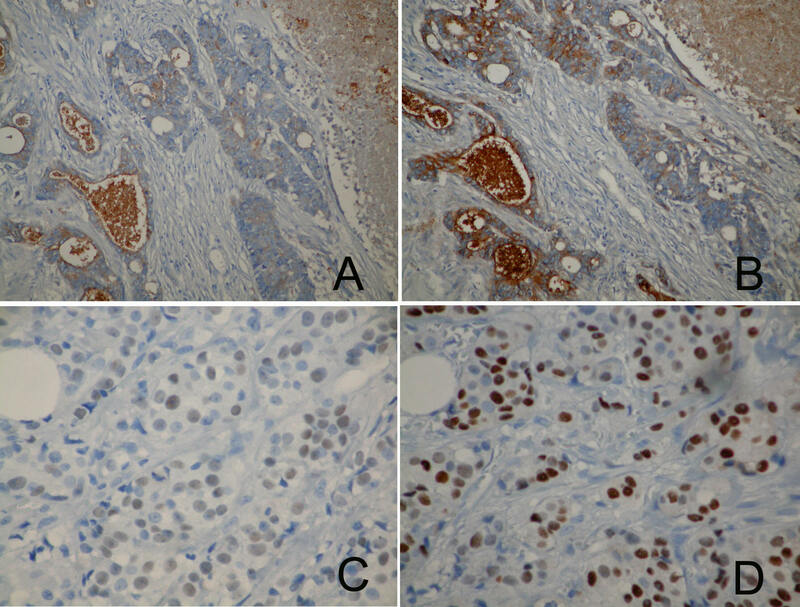 A and B are colon cancer stained by Ms anti-CEA. 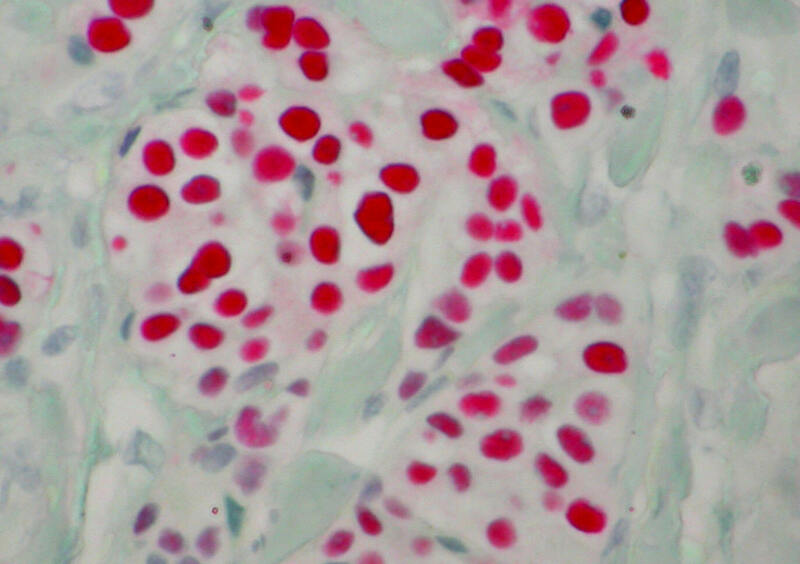 C and D are breast cancer stained by Ms anti-ER. B and D are detected using Polink-2 HRP (cat. No. D22-15) kit. A and C are detected using other supplier’s polymer kit. The intensity of immunostaining using Polink-2 HRP kit is significantly stronger than other source polymer kit. Polink-2 HRP Detection Kit is the second generation of polymer-based detection system that uses proprietary polymer helper and polymeric HRP-linked secondary antibody conjugates to achieve super sensitivity and consistent immunostaining. This technology provides excellent sensitivity and high specificity. It is about 3-4 times more sensitive than the 1-step polymer detection system and biotin-streptavidin system. It helps to achieve better results on difficult-to-work antibody and nuclear staining. It is a biotin-free system, so therefore overcomes the non-specific staining caused by streptavidin/biotin system due to endogenous biotin. Since it has higher sensitivity than other conventional methods and the 1-step polymer detection system (Polink-1 HRP system), users may need to further dilute the concentration of primary antibodies if switching from conventional three-step or Polink-1 HRP detection methods. Refer to the following table to choose Polink-2 HRP for DAB or Polink-2 HRP for AEC. For single species capacity or ultra sensitivity, please choose the third generation of polymer detection system, Polink-2 Plus HRP detection system. Ms. Anti-ER stained breast cancer using Polink-2 AP kit (Cat No D24-110) with Fast red. Rb. 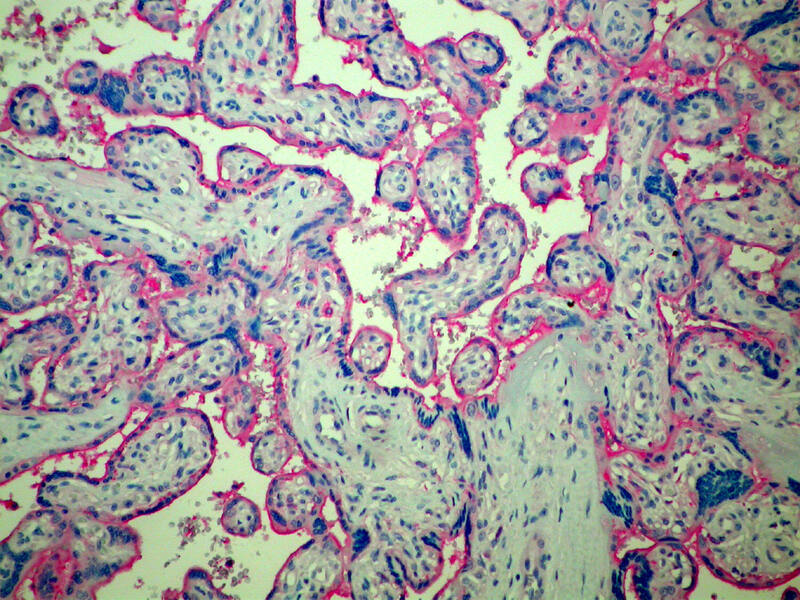 Anti-PLAP stained placenta using Polink-2 AP kit (Cat No. D24-110) with Fast Red. Polink-2 AP detection kit is the second generation polymer-based detection system that uses proprietary polymer helper and polymeric alkaline phosphatase (AP)-linked secondary antibody conjugates to achieve super sensitivity and consistent immunostaining. This technology provides excellent sensitivity and high specificity. It is about 3-4 times more sensitive than the 1-step polymer-AP detection system and biotin-streptavidin system. It helps to achieve better results on difficult-to-work antibody and nuclear staining. It is a biotin-free system, so therefore overcomes the non-specific staining caused by streptavidin/biotin system due to endogenous biotin. Since it has higher sensitivity than other conventional methods and 1-step polymer detection system (Polink-1 AP system), users may need to further dilute the concentration of primary antibodies if switching from the conventional three-step or Polink-1 AP detection methods. Only broad spectrum detection kits are available in Polink-2 AP detection system. For working with single species or ultra sensitivity, please choose the third generation of polymer detection system, Polink-2 Plus AP detection system.